Enjoy a Kauai horseback riding adventure with a private guide, which allows for the possibility of some trotting or cantering. This tour also includes a waterfall hike, swim and picnic. Enjoy a guided horseback ride across Princeville Ranch's pastures. This horseback adventure includes a short hike to a gorgeous 80-foot waterfall where you can have a refreshing dip and a delicious picnic lunch. Saddle up and enjoy a Kauai horseback riding tour across serene ranchlands and into the island's rainforest. Along the way, enjoy scenic views of lush valleys and mountains. 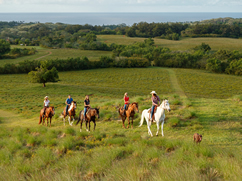 Princeville Ranch on Kauai's north shore offers both private and group horseback riding tours. Both are suitable for beginners and advanced riders. Their tours take riders to a waterfall, with the option of having a refreshing dip. Kauai-Tours.com offers these Kauai horseback tours at a discount. Make your reservation today!